Last November, early in the month, I was in the garden area of a local store. I saw a box with the picture of a beautiful red amaryllis on it. I picked it up and read the claim, that all I needed to have such a beautiful plant by Christmas was in that box. It contained a plain pot about five inches in diameter, a package of “stuff” which, when soaked in water, would expand into potting mixture. Then there was a very ugly, brown bulb about three inches in diameter which was to be placed two thirds deep in the potted mixture. After planting, I placed it where just the right amount of light would reach it, and I watched and felt when water needed to be added. 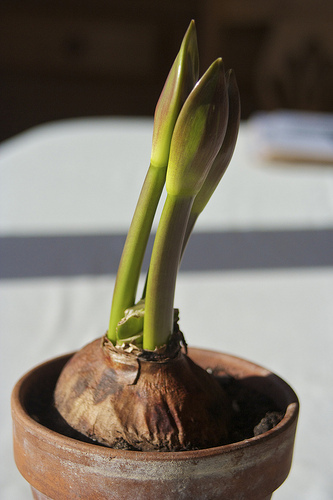 Soon I saw a bit of green peeking up from the bulb and then a few days after Christmas, a tall stem of brilliant red amaryllis blooms graced my window sill. I couldn’t help but compare that transformation to our lives. He had already explained that the “treasure” is the Gospel, which is in our earthly body (little clay pots) to be displayed to a dark, blinded world so Christ might be glorified. Just as I loved the flowering of my plant, I enjoyed the process of daily providing that which would help it be the best. Since we are made in God’s image, I think He involves Himself in the daily process of our lives to bring out the excellency He sees in each one. “Who, me?” Maybe you feel you’ll always be just like the ugly brown bulb. Ordained? To be used of God? Yes, indeed. My husband heard about your blog from someone and he mentioned it to me. What nuggets of encouragement and as always, you use such clear, everyday illustrations. I still recall a message you gave to the ladies at Bro Gray’s church a number of years ago at a Soul Winning Conference about reading our Bible, God’s love letter to us. You related it to one of the young women who you knew in the crowd who had recently become engaged and asking her ‘did she often read the love letters she received from her fiance’? She of course gave an excited “yes”! It was such a clear illustration and I’ve never forgotten it and have used it many times myself when encouraging new Christians to read the Bible. I took time to read several of the former posts and wanted to thank you for writing your Monday morning thoughts. 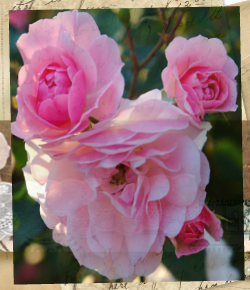 I can’t help myself, I have to write again and thank you for your Mondays. One of my resolutions for 2015 was to listen to at least one Jack Hyles tape a week, and this week he preached that what God gives you pass it on. Also don’t be such an intellect that other’s won’t get it. In grade school I had to take a special phonics class because I didn’t get it.To this day I am a visual person and I love the lesson of a clay pot and a dirty bulb so carefully cared for, that in the end can bring such joy. Also ordained having a meaning for all, isn’t that what God has always wanted. Thank you Mrs. Hyles and your life is so beautiful. Like your amaryllis, any thing or person that amounts to anything in life has more than likely had someone love and nurture them. Glad I have a Heavenly Father who loved me and is still “working on me.” May we always care and share the gospel with others. Thank you for another thought provoking lesson. I love you! Well, instead of being angry and throwing away a good kit, we found some more soil, and added it in until the consistency was just right. We discovered that the old brown bulb didn’t care, and soon sprouted up just as it should. Praise God for small miracles! My husband of 15 yrs is a nature lover. He recently bought me tulips and wild irises for Valentines. He will notice the smallest details in God’s creation, and point them out to me. I am learning to appreciate how amazing plants and flowers truly are, because my sweetheart thinks they are. Thank you, Mrs Hyles. Have a blessed week! Thank you for your sweet and thought-provoking “Happy Monday” contribution for today. I stumbled onto your site last week and have enjoyed reading your shared thoughts. I would like to think you remember me, but with everyone you know, I realize my name is only one in a thousand. I wanted to share with you that today is my spiritual birthday! I was saved on 51 years ago when I was eight years old. I will never forget what happened on that Sunday night, February 16, 1964. My pastor, Robert L. Humphreys, had scheduled an evangelistic meeting with a 29-year-old preacher from Evansville, Indiana, named Billy Kellough. After he preached on that Sunday night, a little eight-year-old boy named Danny Parton walked an aisle and was led to Christ by a deacon named Ben Conrad. I remember it like it was yesterday. Praise the Lord! I would also like to thank you for the positive influence you and Brother Hyles have had in my life. I will turn 60 this year, and I have to say that getting to know you both was one of the best things that ever happened to me. Thank you, Mrs. Hyles! Thank-you so much for your words of encouragement again today. I too have been greatly inspired by your practical illustration of the Red Amaryllis bulbs, although I have never attempted to grow one. It’s winter here in Michigan, and as I look out my window, all I see are grey skies, barren trees and mounds of snow. Last fall I took a lovely picture of the tree outside my window, all brilliantly gold and radiant from the afternoon sun. Today I took yet another picture of the same tree, with it’s barren brown limbs against the cold grey winter sky. It was if the Holy Spirit had asked me this question. “Is the tree alive”? My response of course was Yes…although I saw no evidence today that would support my answer. All too often, I have experienced the same seasons of bareness in my Soul. I know what God’s word says to be true! However, to the visible eye, my heart aches as I sit in God’s great waiting room of affliction and pain. My Soul longs for better days. I’m sure there are plenty lessons to be learned in this place and my Prayer is that I won’t miss a one, as I stand on God’s Promises and wait patiently for His direction. You have reminded me that even in the winter season’s of our lives, there IS yet beauty to be seen.